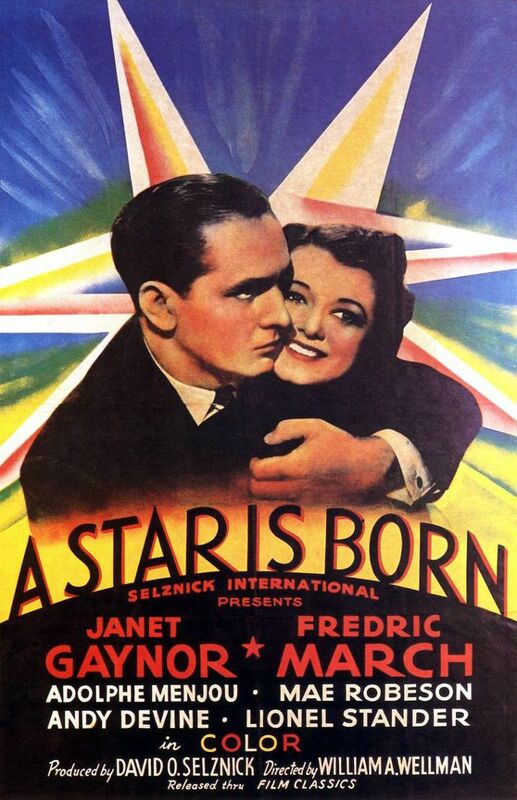 This review is of the edited TV-14 version of the film. All thoughts below should be addressed as such as a review of the unedited version of the film would be more negative. Well, it looks like the sequel to Halloween has finally arrived. There’s only so much that this film can try to do to be good. From the start you know that it’s not going to be good, but can it at least be entertaining? Well, I’ve seen worse horror films so I’ll give it that, but this is still one of those sequels where you just shake your head. Myers has also grown a lot more powerful over the course of a few minutes as he suddenly becomes just about invincible here. Why is he bullet proof!? The film takes place seconds after the first which is impressive. It’s an underrated approach and a super cool one if you ask me. I always like when the story picks up immediately like this. Basically, Michael Myers escaped capture last time and he decides to go right back to his goal of murdering everyone in the neighborhood. The cops have to try and stop him, but they can’t seem to save everybody. It looks like Laurie is going to have to save herself as expected. After all, when everyone else fails then it’s time to just do it yourself right? Most of what I’m going to say here could be applied to the first film or any film in the series. 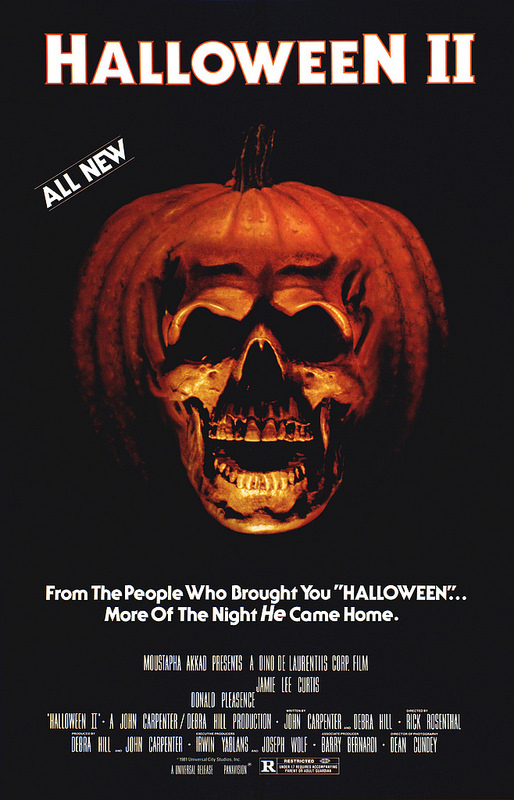 That’s because Halloween follows what I’d consider to be the typical horror film outline. The only trope it seems to avoid is the animal violence one which I will give it some props there. I’m glad it was able to do that at least. The first thing dragging the film down is naturally the over the top violence. Naturally everyone meets pretty grim ends at the hand of Michael Myers. Most of the characters don’t even put up a fight or they go down without making a sound. (Rhyme intentional) Given that he has super strength and such at least it’s a little more believable than in some of the other films. Still, the body count in this film is incredibly high as nobody seems to have a way to communicate and he just takes down the whole town one at a time. It’s scary just how many people he gets and the cops never even find out about it. Then you’ve also got horror trope #2, the terrible characters. All the characters seem to care about is getting past the friend zone. Two characters decide to hang out at a hot springs when they’re supposed to be on duty and looking after the patients. Then they can’t even tell when the other character has been bumped off. It’s also just an excuse to get a fanservice scene in since horror films seem to need that. There’s also the pointless emergency staff guy who keeps on flirting with Laurie throughout. The plot doesn’t go anywhere and I don’t even really get how the guy died. Sure, he tripped, but why would he die from that? Perhaps part of the scene was cut for the TV version or something but if there is no more context to that scene then this guy’s just a joke. He should have been written out of the film. Laurie’s a reasonable character here. In fact, she’s the only reasonable character. She realizes very quickly that nobody else here is even remotely competent so she escapes from the hospital to try and save herself. Of course the other characters give away her hiding spot and drop the gun. If I was Laurie I’d definitely leave this town and never come back. Sam talks tough and he has a gun so he’s better than most of the characters, but he still isn’t the smartest of the characters. He plugs Myers 6 times and the guy doesn’t go down. What does he do in round 2? He shoots him 4 times. Look, if you think that this guy is basically unstoppable then you have to do all that you can to stop him. Trying to walk over and take his knife away isn’t smart so Sam is smarter than the policeman, but then go for a head shot or something. Do whatever it takes to make sure Myers stays down. Then Sam just goes back into running mode and his gun jams. Well gee…that’s just bad luck now. Finally we’ve got Myers, but he isn’t even a character in this film. He’s basically just a zombie that is going around murdering people. I don’t think he got a single line here so maybe the film is trying to hint that he is basically dead by this point. Maybe the 6 bullets did finish him off and he is a zombie. Then again, I forget if he talked in the first film. Maybe he just can’t talk. Either way there’s not much to his character. The rest of the characters in the film just exist to die so you feel bad for them. In slasher films like this one only the main character tends to live while everyone else dies. It’s a rather tragic existence for the whole town, they were just outgunned. There’s just nothing positive to say about the film. It’s not fun to watch and I dare say that it might be more over the top than the first film. Although I think the first film had animal violence so it was probably still worse than this film. The only positive I can say for this film is that it avoided the big 0 by avoiding the animal violence. Even then it was fairly close, but I think a 1 is reasonable. The film also isn’t particularly long so at least it doesn’t overstay its welcome quite as drastically as you might fear. Imagine this going for 2 hours? Now that would be really brutal! Overall, Halloween 2 doesn’t try to do anything particularly clever or unique. It’s basically just a rehash of the last film. If the last film was a good movie then that wouldn’t be a bad thing, but there’s just nothing particularly good here. It’s a pretty mean spirited film where the villain has the edge throughout. Surprisingly there isn’t even a stinger here so I suppose the heroes can finally get a little peace at least. It’s a silver lining, but it doesn’t change the fact that I’d highly recommend avoiding this film as much as possible. Just stick away from it and you’ll be the better off for it. The Maze Runner was hyped up as the next Hunger Games and that series hasn’t even finished in cinema world yet! Obviously the Maze Runner must have known something that I didn’t so I finally got around to checking it out on DVD. Great concept, but the execution left much to be desired. No worries, the Maze scenes are the best part so that did live up to the billing. Well, the film takes place in the near future. A lot of kids have been trapped in a Maze and they don’t know how to get out. Every month, a box is sent to them from underground with one more teenager and food supplies. They’ve spent the last few years just trying to survive in their living space as they hope for the best. There are “Runners” who are teenagers that are selected to check out the maze. They have to be careful though since the Maze closes every night and staying inside will mean imminent destruction. So, they have clung to their lives for quite a while and that’s when good ole Thomas shows up. He doesn’t like this status quo…and he’s going to shake things up! As you can expect, we’re all just waiting for Thomas to go into the Maze. It was in the trailer and we all would have expected it anyway. At first, I was pleasantly surprised with the film’s pacing since Thomas went inside it sooner than I had thought he would. I was practically cheering…until he left and we spent another long period of time outside the maze. (The living quarters are at the center of the maze so I say “out of the maze”) Don’t get the wrong idea….seeing teenagers discuss how they’re all doomed can be entertaining if handled right, but it just isn’t. Most of the scenes at the living space are just boring or not fun to watch. We have the stereotypical bullies and the twist is that almost all of them are bullies. Everyone falls for peer pressure and the natural born leader wants the status quo to stay. The actual leader is a nice enough guy…or is he? I actually didn’t like him and his replacement was not much better. The whole thing just felt like a scam from Thomas’ point of view and nobody wanted to give him any intel. Just about everyone seemed to be mindless as they would just follow the order’s of the leader. It’s basically a dictatorship and this is certainly not the kind of place that you would want to hang out in. The atmosphere of the film is very similar to Resident Evil during the climax. Once the maze is…no longer a factor, you expect zombies to start jumping out at you. It’s hard to describe of course, but the area is just very foggy and everything looks very hi tech. You quickly start to get your hopes up about aliens, zombies, or something else. Naturally, the film sends you crashing back down to reality with one of the worst plot twists that I have seen in a long time. The cliffhanger just makes you uninterested in what’s going to happen to the heroes or you at least lose most of your interest. There just doesn’t seem to be much of a point in their journey right now and they should have gone with the aliens/zombies idea. The atmospheric effect is pretty good and few films can actually pull it off, but you need something to happen to keep the atmosphere or it’s just going to fly away. Thomas is a decent main character….I guess. He just strikes me as pretty annoying to be honest and he’s not very quick on the uptake. It doesn’t help that the other kids shun him of course, but he is always in the dark. He decision to help another one of the kids during a dicey time was pretty good of course and he managed to do well against one of the monsters, but that was mainly plot hax. He also could have put up a much better fight in the getting beat up wrestling game. I’ll never understand how someone can just stand there and watch himself get pushed around without much of an effort. Naturally, Thomas does land one hit so he quickly starts to gloat and then takes his eyes off his opponent. I can’t even…..
Teresa is the main heroine and she shows up as the final person to be sent to the ring. Naturally, she’s a girl so the other boys are mad/afraid that she’s here and she’s also shunned. She doesn’t help her case as she throws rocks at everyone, but I can’t blame her and I just hope that she can fight. Thing is…she feels like she is only here so that we can have a female character involved. Most films don’t pull a reverse harem situation like this in Hollywood so it’s pretty intriguing and I don’t mind so long as they don’t start to fall into the romance game. At most it is implied here and you can easily deny that. I have to give the Maze Runner props where it is due right? As for the other characters, they’re all pretty unlikable and it’s hard to even talk about them. Newt is the second in command who gets very defensive at the drop of a hat and he just wants Thomas to stop asking questions. He’s the kind of guy who is immensely annoying to be around and he can’t completely stand up for himself even if he’s the leader. Alby actually seems like a nice kid at first, but we know that this can’t last and sure enough…he shows his dark side. He gives Thomas a very lightly veiled threat about what will happen to him if he breaks the rules and he did allow Thomas to be roughly handled when he first came out of the box. Sure, Thomas may have ran, but it was definitely uncalled for. Then, he cracks towards the end and while we’ll probably get a lot of sob stories and twists so make this seem reasonable, it’s still pretty sad. We can’t forget about good ole Gali. He’s the main bully and he would rather thin the ranks of the heroes then go up against the maze. He’s always pretty unreasonable and he resents Thomas from the very start. You have to wonder how he got along with everyone else. He’s just your stereotypical bully and he pushes everyone around when he feels like it. There’s nothing likable about this guy and the film basically admits that he’s crazy by the end. We also have Chuck, who is the only guy who is really nice to Thomas and wants to be his friend. He also wants to see his parents someday…..Hollywood loves their drama so I’m sure you can imagine how this subplot ends. Minho is the main runner and he warms up to Thomas after the hero proves his worth, but I wouldn’t call him a very good character. He basically doesn’t mind Thomas because the main character is useful to him…that’s about it. Before that, he is pretty cold and he doesn’t mind leaving allies to get stomped on. We can’t forget the monsters right? There is a pretty chilling moment where we think that there might not be any actual monsters here thanks to a twist, but that it luckily thrown out of the window right away. There are monsters here and they are almost tough. They are essentially mechanical scorpions that move like spiders and there are a lot of them. They’re definitely not very strong as you can destroy them with a simple, sharp stick, but they move quickly, which can make this difficult for the average kid. I’m always glad to have monsters here, but they are definitely not impressive power wise. Their design is decent though. The actual violence isn’t as repulsive as the first Hunger Games, but it can get rather intense as we peer through one of the monster’s remains. The rest is pretty tame as we just hear/know things without seeing them. It uses the implied violence tactic that the Dark Knight used, which is actually pretty good if you need the violence angle. It’s a safe way to still get the message across. It naturally results in a rather dark tone like The Lord of The Flies and it continues on til the end, but it could be worse. The violence isn’t much of a negative here, but it’s still worth a mention that this definitely isn’t the kind of film that you want to show your kid. There isn’t really a soundtrack although I’m sure that there are some generic/free domain themes in this film. That certainly doesn’t help the film. The main reason why I just didn’t like this film is because of the scenes at the home base. It’s hard to really describe why it’s so awful there and it may be a number of things. I’ve seen the “main character gets bullied” plot to death at this point and it is definitely not cool to see. Especially since the film is already devoid of any hope, we’d rather not see the main character get put in such a position. The actual setting is also very unimaginative and not very fun to look at the then the disappointing ending didn’t help matters. This is the kind of film that could be much better with adults as the main characters and better still if it had come out in the 80’s/60’s as a black and white film with a lot of debate. Sort of like 12 Angry Men. A reasonable discussion about whether they should leave the Maze or not as the whole film could have been much more interesting. The film just dropped the ball in all of these areas. 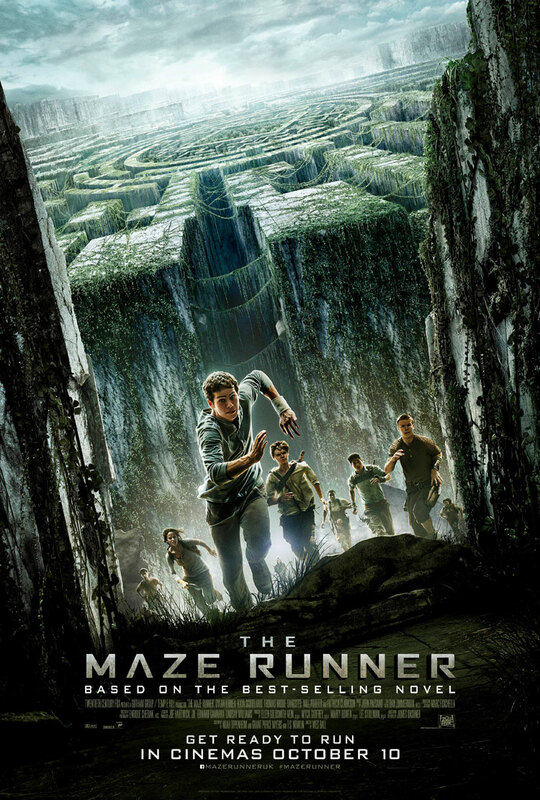 Overall, The Maze Runner is about as “good” as I expected. It does manage to crush the Hunger Games, but you are still left feeling empty. Is this the extent of our novel adaptions or are there other titles that we are missing? The Seeker and Alex Rider seemed like good bet back in the day, but they were cancelled and Harry Potter is already over. Ah well, maybe The Maze Runner gets even better with the sequel. The mystery is pretty engaging and I did like the concept. I could almost recommend it to you on that alone, but I could also just recommend the trailer instead. If you don’t mind monster violence and the classic bully scenarios going on for a very long time, then I recommend this film. If the thought of a rather depressing film where all of the main characters are teenagers who are pretty unlikable is too much to handle…you may want to run all the way back to the first Harry Potter film. It’s your choice! I’m sure that we were all thrilled to see Hollywood finally start to adapt the events of the Bible. It was long overdo. We’ve had many films about the Civil War and other big events and these deserve just as much screentime. On the other hand, many Christians were pretty skeptical since the trailer did look pretty suspect. Unfortunately, they were right to be wary of this film since it’s example of how the theater can try to make the Bible “mainstream” and inaccurate. As you may have guessed, this is a Very loose adaption of the classic tale. In the Bible, God decides to wipe out most of the human race by having a flood appear on the Earth to wipe everything out. He tells Noah to build an ark. 2 of every animal would go on it along with Noah and his family. The story was not very long in the Bible, but it was a very significant event in history. After all, it was where God said that he would never end the world by flood again. The film takes that plot and adds tons of stuff to it while “fleshing out” the characters to make sure that they are all pretty unlikable. Now, adapting the Bible is a tricky matter in itself. I’ll definitely admit to that. Some of the events can be pretty brutal and it can be tough to see all of the animals being sacrificed on screen from the old testament. That being said, everything that is contained within the Bible is there for a reason so it must be kept in. It’s tough for me to watch as a big animal lover and the events can be pretty violent. Still, it must never be changed as it can trick new believers and they can miss out. So, I may still have a tough time watching a faithful adaption, but at least I would be watching it as it was meant to be seen. Dragging out the tale of Noah to 2 hours would be tricky for anyone and keeping it completely accurate would be challenging. That being said, the film didn’t need to be over 2 hours and the writers could have consulted with Christian scholars and pastors to get a better consensus of how the film should go. It would be more work, but it would be worth it. It would have also been worth their while to have made the film only run for about an hour or an hour and a half instead of adding tons of plot elements. Where did the film go wrong? Just about everywhere. We have “The Watchers” who are fallen angels that disobeyed God because they wanted to help the humans while God had already decreed that the descendants of Cain would have to live by the sweat of their brow. God punished them by merging them with the soil of the Earth so that they became rock creatures. Then, the humans betrayed them and destroyed most of The Watchers. The Watchers became angry with humankind and they fled to a rocky area. Well….do you remember any of that from the Bible? I certainly don’t and I read that saga pretty recently. The whole concept of The Watchers is something that I don’t like. Personally, I have always pictured the Angels to be humanoid and made of light. (The Watchers transform back into this form when they die so at least their natural form was more in line with my thoughts) Of course, we won’t really know until we go to Heaven and their forms may not be so easily comprehended. Nontheless, I don’t believe that a human could ever destroy one of them, even if they were cursed to walk the Earth. Ever. That’s simply not possible and a complete insult to them. It should also be noted that the word God is never used. They just refer to him as “The Creator.” The way that the universe is formed also makes it seem like it was a natural occurrence. God created the light and then everything just formed on its own….yeah right. The film likely didn’t want to offend atheists by mentioning God, but then why are they even making this film? This is supposed to enlighten more people to the word of God and to be a good way for Christians to see the story. 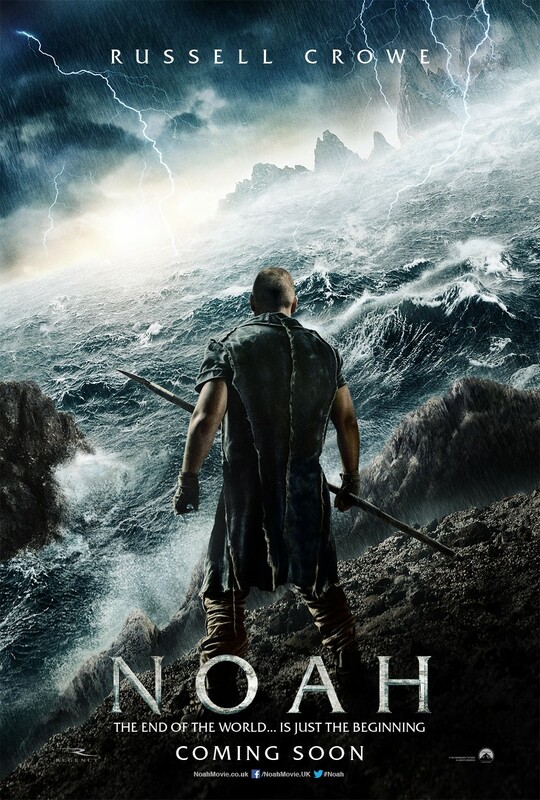 If the writers won’t go all the way in making this a true adaption of the story of Noah, then there is no point. Noah is also a pale shadow of himself. His big moment involves….disobeying God. He believes that God wanted him to murder two babies (You can already see how insane this is right?) so he does everything in his power to destroy them until he is finally next to them. Then he tells God that he will not do it and he leaves. One of the characters tries to tell him that God actually wanted him to spare the babies and he made the right choice, but it was handled poorly. Noah basically ended up choosing his family over God. He definitely misinterpreted God’s message as destroying the babies was not what he was meant to do, but it would have been better if God had told him to stop. Back to Noah himself. He mostly just went around beating everyone up as he got the Ark ready. This just wasn’t the Noah that I was expecting. Self defense is good and all, but having him murder a bunch of people in one of the opening scenes isn’t how his character portrayal should have started. We’re supposed to see that he is a good man in a corrupt world, but we never really see this. He seems to be just another villain as he tries to murder the infants. You can tell that my experience with the film was pretty negative. It’s just hard not to take a few shots at the film when everything was so wrong. Want to know another big problem with the film? One of the villains actually breaks into the Ark. That definitely did not happen in the Bible and it undermines everything. The whole point was that God protected Noah and his family once they were in the ark. They had nothing to fear because they knew that God would keep them safe. Not in this version and the villain actually murders a few of the animals. There is seriously no justice in this film. The film has a ton of unnecessary animal violence and it’s very gritty throughout. We see many people dying and injured on the ground as they cannot leave. One of the worst scenes is when Noah walks into the enemy city and witnesses slave auctions and merciless animal violence. Don’t worry, I can possibly top that with another scene. Perhaps it can’t top that last one in terms of terribleness, but it comes close. Noah’s son helps a girl to escape this place and she trips on one of the bear traps. Noah’s son calls for Noah to come and help. So…Noah grabs him and runs away as we see the girl get trampled to death by the incoming mob. Noah regrets nothing since he believes that everyone in the village is evil with no exceptions. No exceptions. After all, he believes that his family are the chosen ones that God has deemed to live so any new life must be destroyed. Hence, why the baby must die. I could likely go on for a while, but you get the jist of it and this technically isn’t a review. Just know that Noah is a really bad film interpretation of the story and I definitely would not recommend it. God’s Not Dead is a perfect Christian movie to watch that is fictional, but tells a good story. Son of God also came out recently and I can assure you that it is a pretty faithful movie about Jesus. Let’s hope that Exodus will be better as it will be hard to be worse…..but I wouldn’t get my hopes too high. Even if this was just movie that didn’t adapt the Bible, it would have still been a pretty poor one and you can bet that my score for it would have been extremely low. This is a story of brutality and of a man who lived through the great flood, but there is nothing about God’s kindness or anything to really show that he is alive at all. In the end, I’d say that the film….sunk.